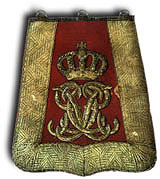 There are only three known sabretaches that were worn by the 7th. The first was introduced with the new Hussar uniform around 1805. As early as 1727 the 7th were known as the Queen's Own and have maintained the use uf the Queen's cypher ever since. 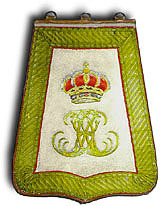 The first pattern has Queen Charlotte's cypher on a buff ground which matched the regimental facing colour. The uniform was changed in 1814, doing away with the buff facings. A completely different pattern was called for. The ground changed to red and the cypher was redesigned but was still a reverse CR. By this time the Prince Regent was ruling, but his mother, Charlotte was still Queen. She died in 1818 but the CR cypher remained. On the accession of George IV it could be argued that Caroline of Brunswick was Queen but I am sure the 7th regarded their appellation of Queen's Own as referring to Charlotte. 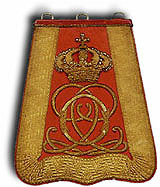 The gold lace pattern changed to a two-inch Austrian Wave and the crown to the Guelphic version. For some reason, the 7th never displayed their battle honours on the sabretache, even though they were awarded Peninsula and Waterloo. The final pattern was introduced on the accession of William IV in 1830. This had a cypher that combines two interlinked Qs and an O for Queen's Own. There was no change in this pattern until the abolition of the full-dress sabrtache in 1902.